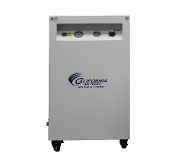 The CALIFORNIA AIR TOOLS 20040SPCAD Ultra Quiet & Oil-Free Air Compressor in Sound Proof Cabinet is designed to be one of the quietest 4.0 Hp air compressors in the industry having only 65 decibels of sound. The Powerful (2) 2.0 HP (SP-9421-22060) motors operates at only 1680 RPM creating less noise and less wear. The Oil-Free Dual Piston Pump System is engineered for high performance, durability and less maintenance. The CAT-20040SPCAD Air Compressor has a Oil-Free Dual Piston pump designed to have a life cycle before wear of 3000 Plus hours compared to other comparable air compressors with life cycles of 500 hours or less. The large 20 Gallon Steel air tank and Soundproof Cabinet is 230 lbs. The sound proof cabinet has two latching doors that allows for easy access to the air compressor and componets. The three cabinet exhaust fans are used to remove air from the cabinet to reduce heat and provide a cooler working condition for the air compressor. The 4 caster wheels makes moving the air compressor from location to location very easy.